The majority of challenges a student might incur, when studying Tai Chi, can be avoided by following the suggestions offered in a previous posting on this Blog titled Doing vs. Practicing. However this is such an important topic I want to expand on my previous posting. The single most frequently asked question by students is “When am I going to get it “. My standard answer is “ I’ll let you know, when I know “. The actual answer is … Never. As long a you continue to study you will never Get It. Actually, the longer you study the more you will realize how little you Get It .... and how un-important that quest is. Tai Chi study is a trip, a journey. I know this is a very new age sounding response that is an over used bumper sticker, but in this case it’s 100% on the money. Studying Tai Chi is an endless process of improving your body’s alignment, learning new moves and transitions, improving the quality of each component, conditioning your mind and body to meet force with lesser force (the connection to functional relaxation), and in the process addressing the many scourges of the 21st century such as; stress, high blood pressure, cardiovascular disease, stroke, depression etc. In addition you are positively addressing issues and conditions like; osteoarthritis, fibromyalgia, neurological disorders, balance issues etc. Here’s the best news. You don’t have to “Get it” to start getting all these benefits from your Tai Chi playing ( doing Tai Chi is called playing and those playing are called Tai Chi players). Every movement in Tai Chi has the ability to produce profound positive results. The more you practice, the more will transition into the doing part ( see Doing vs Practicing ) and the greater the benefit. You set your pace. However, if you are always chasing “When am I going to get it”, you will be missing out on the benefit you can derive from every class and every time you actually play Tai Chi. Here’s another bumper sticker. “Slow Down and Smell the Roses"
When a student says I'm Bored? or what's next?.. what they are saying is " ok, I've been on this one move for 2 weeks ... how about moving on? " Moving on for Empire Tai Chi students is based upon the quality of movement not quantity. This is a traditional Tai Chi philosophy that can be challenging at first. However, soon students start to get measurable and highly predictable, positive benefits from their Tai Chi and embrace the qualatative concept as a basis for learning new movements. Often, taking a step back equals a giant step forward. Sometimes we will spend more time on a move or transition because the student is really connected and they have a chance to maximize principles at a comfortable spot in a form. Other times we will introduce a new move to a student who is stuck, because we feel the next move will help them get un-stuck. These are evaluations we make as we watch students review on their own. When we know that a student's primary goal is stress reduction and relaxation ... and they ask " What's Next ", we take that as an indicator that the student will be best served by slowing down in order to go forward. Doing - Select a single move or combination of moves that you feel completely comfortable with. Maybe it's just one move like the preparation .. or any combination of connected moves. These should be moves that you can do in an alpha state ... flowing, meditative and under relaxed control .. with realy good body alignment. Do these for 5, 10, 15 minutes .. however long you want. Practicing - First you have to select a sequence that is not particularly comfortable for you. A sequence where you have the gross memorization, but the sequence feels linear, disconnected, steps are not in control, you are feeling stress in your upper body when you raise one leg. You know the feeling! Like an Elephant on ice skates. Practice doing these few movements focusing on a different principle each time you do it. Stepping under control and moving from the center are biggies, keeping shoulders down and soft, incorporating the empty foot, hips front, staying round, maintaining one height and one pace and examine aspects of functional relaxation throughout all aspects of the moves.. If you keep "practicing this sequence" .. building more and more Principles into these moves it will start to feel different. The more you practice ... the more sequences come into the Doing fold ... and the more you will get out of the moves you were already connected to. How the hip moves: Important! in the legs (not the torso). Since they (hips) have no mechanism by which to move in and of themselves, it is an error to think that we move from our hips. Like a tree being swayed by the wind, the hips are caused to move. An ignorance of this critical concept has left somepractitioners struggling for decades, trying to find root, fluidity and true stickingability. The hips must allow movement. They must acquiesce to pressure, letting force, movement and energy transfer up, down, forward, backward and side to side. While the pressure may come from the opposite leg¹s driving force or from a partner¹s pushing, the hips themselves must remain receptive, passive and clear. them to rotate as a matter of course. This is often described as folding the hip or kua. Note: Sam Masich is a much respected Internal Martial Artist. I have had the very good fortune to attend workshops held by Sam at the Tai Chi Farm. While in Tai Chi class you are constantly being reminded to keep your hips to the front, your shoulders down and relaxed and your knees aligned over you feet. When talking about the hips being front .. we are actually talking about the Pelvic Girdle which is loosely referred to as the Hip Region. In fact the hips are joints and are meant to rotate and flex… but not meant to rotate if the corresponding leg is weight bearing. When we say shoulders down and relaxed, we are actually talking about the shoulder region and most specifically the trapezoid muscles. An example of the pelvic girdle and a hip joint rotating at the same time and root leg being properly aligned would be during the transition from White Crain Spreads it's Wings into Brush Left Knee. During the transition, while the right leg stays rooted and special attention is paid to the right knee alignment, the upper body and hips ( pelvic girdle ) turn to the front and the left leg ( empty) turns inward. 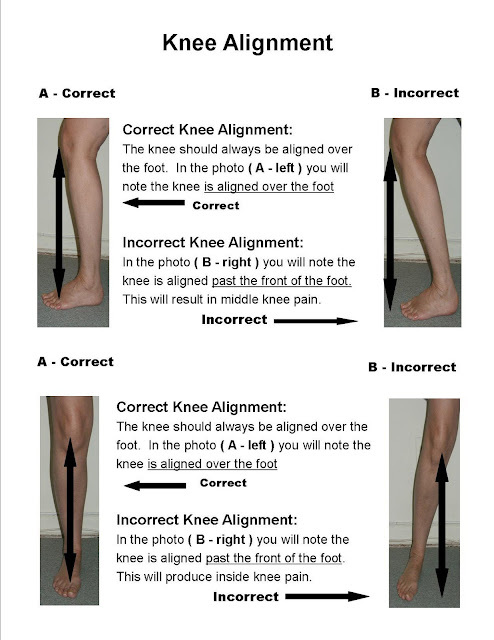 Knees are ALWAYS slightly bent and aligned ( over ) the foot .. Feet should be the width of your shoulders. Allow each breath to role into the next. Expanding belly on the INHALE ..... Gently contracting belly on the exhale. After a while transition to doing this exercise without using your hands. This is a great exercise to do before going to sleep. Stop exercise if you get light headed ... try to do all breathing through your nose. 2. SLOWLY turn you upper body only to the left and shift Left. 3. While you slowly turn your upper body back to the center .. and WITHOUT SHIFTING YOUR WEIGHT .. Step to the right with the right foot. Visualize there is a small soft ball in the middle of your foot. Slowly compress the entire ball into the floor until the edges of your foot are on the floor …. then slowly shift your weight so you are balanced equally Right and Left. All movements take place during an inhale or exhale. Your breath dictates the pace. You are constantly breathing, turning and stepping slowly under control … without ever holding your breath. Your weight bearing leg is your root ( with bent knee ) … that leg does not move. Health: An unhealthy or otherwise uncomfortable person may find it difficult to meditate to a state of calmness or to use Tai Chi as a martial art. Tai Chi's health training, therefore, concentrates on relieving the physical effects of stress on the body and mind. For those focused on Tai Chi's martial application, good physical fitness is an important step towards effective self-defense. Meditation: The focus and calmness cultivated by the meditative aspect of Tai Chi is seen as necessary in maintaining optimum health (in the sense of relieving stress and maintaining homeostasis) and in application of the Tai Chi forms as a soft style martial art. Martial art: The ability to use Tai Chi as a form of self-defense in combat is the test of a student's understanding of the art. Tai Chi Chuan is the study of appropriate change in response to outside forces, the study of yielding and "sticking" to an incoming attack rather than attempting to meet it with opposing force. The use of Tai Chi as a martial art is quite challenging and requires a great deal of training. 1. All movements start from a movement from your center. Either an expansion, fold, bend, rotation ( with hips stable and front ). Your arms and legs have no motor of their own. Example: In the Wu Chi - Tai Chi ( simplified introductory form ), when in Wave Hands Like Clouds Right, going into Roll Back. If you are weighted ( substantial ) on your Right, because you have turned and shifted Right … when you turn Left, keeping substantial Right, and with Hips front, your Left leg will be moved back and the virtual ball you are holding will be carried across your body and down to your side and a shift will take place as the Left foot touches the ground (under control). Example: From Grasp the Sparrows Tail, Ward of Left in the Traditional Yang Style, going into Grasp the Sparrows Tail, Ward of Right; the upper body turn to the Left creates a root ( 100% Left ) and creates the Holding Ball position ( a combination of turning and sinking ( with hips front ). The turn Right creates a step by the empty Right leg / foot and the empty arms and hands follow through 50 /50. The continued turn right transfers weight to 70% right ( a shift ) and the empty arms and hands follow. Keeping the Hips front allows for the Rotation of the center to create movement. So … if you remember these principles it will help over come inertia and answer the MOST COMMON question asks by students… what moves first. Rotate and Shift / Rotate and Step. If you remain rooted ( substantial ), movements will / can be made under control while protecting the knee of the root leg.